← Seeing is Hearing is Believing. I don’t play Guitar Hero, the massive hit video game (yet). 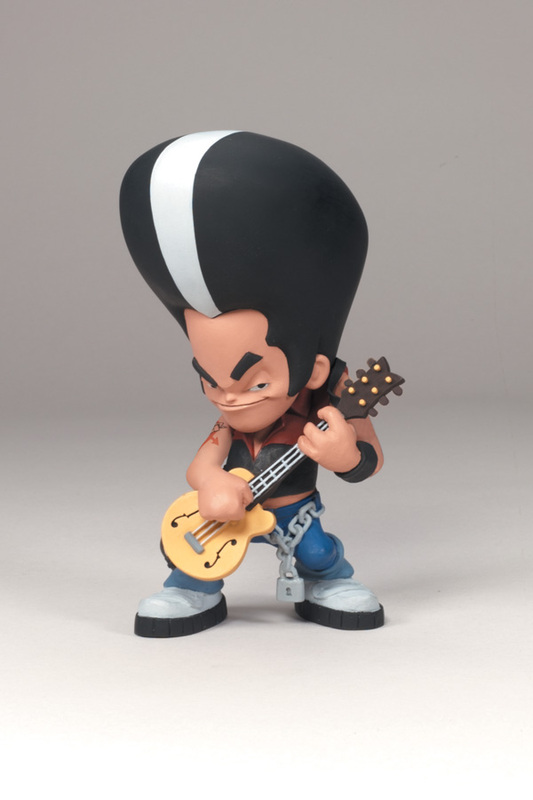 But I can still tell that McFarlane Toys’ Guitar Hero Rockers—2-inch figurines of characters from the game packed deux to a box—are completely ill. If the actual pieces in February 2009 end up looking as good as these final painted sculpts, I’m grabbing all four: Spike-haired Johnny Napalm, bad-to-the-basics Axel Steel, KISS-whore Lars Ümlaut, and, my personal favorite, above, rockabilly renegade Eddie Knox. Total ‘tude, dude.